She has spent her whole life training to be an assassin. Just because the convent has changed its mind doesn’t mean she has. 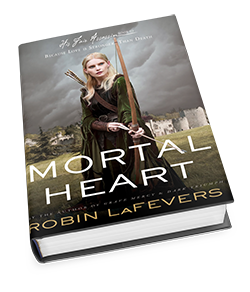 I just love how LaFevers has blended history and fantasy together in this series. Plus, Annith has the potential to be the most interesting character yet, especially with her connection to the abbess. I am so excited to dive back into this world and see what happens with these characters I adore. Plus I just love Annith. I really want to see her come into her own and be a strong heroine. What are you looking forward to this Wednesday? I hope you get a chance to pick this series up at some point, because it is REALLY good! Thanks for stopping by! Yay! I’m so glad that you enjoyed Grave Mercy I hope you like Dark Triumph just as much!